« The Assyrian is the Antichrist! This commentary features a map of the final gentile world empire as described in Daniel chapter 7. The final gentile world empire will be operational during the Tribulation period. It will be headed by the Antichrist, and it will be destroyed by Jesus Christ at his second coming. The final gentile world empire is also known as “The New World Order”. It is the last chance that God will offer men to rule over the earth. World leaders today are ardently working toward the formation of the New World Order. I know that many of us are confused about the size of the next world empire. Most people think that the Antichrist will rule over the entire earth. He won’t. The final gentile world empire will cover the same geographic region that every world empire has covered; namely the old world. You probably think that this commentary is about the New World Order; and yes it is. But even more, it is about the very center of the New World Order. I mean the very center of the New World Order politically, as well as the very center of it geographically! According to Daniel chapter 7 the final gentile empire is formed by combining three groups of nations (or Unions). These “Unions” include 1) The European Union, 2) a new Russian Union, 3) and a new Middle Eastern Union. If you ask your pastor about this he will flip his toupee. This subject, along with Daniel chapter 7 has long been neglected and misunderstood. So there are three groups of nations or Unions that combine to form one big empire. That’s easy to understand. But wait, I told you earlier that this commentary was about the center of this world empire. Well there is a nation that sits smack in the middle of these three Unions. It is the geographic center of the New World Order. It is also the place where the leader of the next world empire sits today. That nation is Turkey! This commentary isn’t about three Unions. It is about four quadrants. All four quadrants of the final gentile world empire intersect at Turkey. That means that the four corners of the old world meet at the nation of Turkey. So then Turkey is the center of the gentile world. Let’s remember that civilization resumed near Mt. Ararat in eastern Turkey after Noah’s flood. Just to let you know. God views Turkey as the symbol and very heart of the world’s rebellion. Ezekiel chapter 38 and 39 describe two separate end time invasions into Israel that are led by the ruler of Turkey. Many nations are joined with Turkey during these battles. These battles represent man’s rebellion toward God and the world’s hatred of Israel, God’s chosen people. Both of these battles are led by the “chief prince” or primary governor of Turkey known as “Magog” in Ezekiel. The Hebrew words translated as “chief prince” in Ezekiel 38:2 practically spell out “Prime Minister”! My commentaries titled “Magog Made Easy!” and “Magog Made Easier!” talks all about Ezekiel chapter 38 and 39. Magog is the ruler of Turkey. He will lead a near time invasion into Israel (Eze 38). He will also lead another invasion into Israel at the end of the Tribulation period (Eze 39). This latter invasion is also known as the battle of Armageddon. Magog may or may not be the same person during these two battles, but he will always be a leader of Turkey. Some of you may have already realized that Magog leads even another third battle against Israel after the first one thousand year reign on earth of Jesus Christ. This battle is described in Revelation chapter 20 below. Rev 20:7-9 And when the thousand years are expired, Satan shall be loosed out of his prison, 8 And shall go out to deceive the nations which are in the four quarters of the earth, Gog and Magog, to gather them together to battle: the number of whom is as the sand of the sea. 9 And they went up on the breadth of the earth, and compassed the camp of the saints about, and the beloved city: and fire came down from God out of heaven, and devoured them. The four quarters of the earth! OK, now this is what this commentary is really about! Four quarters and four corners! The Greek word translated as quarters in Revelation 20:8 is gonia. Gonia means corner or quarter. an angle: – corner, quarter. Turkey is where the four quarters of the final man ordained world empire collide. Turkey is the center of earthly civilization. Turkey is the geographic center of all of the nations. Turkey is where east meets west. Turkey is the epicenter and symbol of man’s rebellion toward God. Turkey is where Magog will come from. Turkey is where the Antichrist will come from. Turkey will lead the world into battle against Israel now; and Turkey will lead the world into battle against Israel latter. Turkey is about to invade Syria, decimating Damascus, and then lead a Middle Eastern invasion into Israel. Turkey is where the Antichrist will come from! I think that he will be a Turkish Prime Minister. 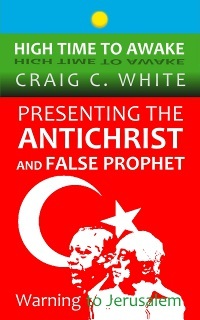 I think that the Antichrist could be current Turkish Prime Minister Erdogan. I am certain that Prime Minister Erdogan is Magog as described in Ezekiel chapter 38. Take a look at The New World Order Map below. The four corners of the final man ruled world empire meet at the nation of Turkey. The New World Order Map depicts the four quadrants of civilization. It also depicts the three groups of nations (or Unions) that will combine to create the final gentile world empire. The Antichrist will be the leader of this final man ruled empire. He and it will be destroyed at Jesus Christ’s second coming. I think that Turkey, Syria, Iraq and Iran will be the four main nations in the new Central Asian Union. Turkmenistan, Afghanistan, Pakistan, and India may be secondary members. The Leopard in Daniel 7:5 has four heads and also four wings. My commentary titled “The Leopard is Upon Us!” details the end time formation of the New World Order. Today we have all become a little wiser. It is High Time to Awake! I have not thought about this until now. Where do you think all of the other countries will be during this time? Will they have been physically wiped out? The old world empires did not include the US. However, the US would not have even been born then. So I am wondering where will the US be when the New World Empire is formed? Sorry for my ignorance on the historical part. But America is not mentioned in Revolation. Hi Jennifer. You are right. The United States is not mentioned in the Bible. Neither is its destruction. I expect the United States to be involved in end time events just like they are now (ie: the Israel and Palestinian peace process, the war in Syria and Iraq). I think that the United States will eventually fight against Turkey at or near the end of the Tribulation period. No nation can help Israel because Jesus himself defeats her enemies . If America or her allies defend Israel against an anti-christ led invasion then it will be America and her allies that get the credit and not Jesus. I’m not sure what role America will play in the battle of Armageddon but it wont be the one of Israels savior. Does it seem like things have slowed down somewhat? It just seemed like things were happening quickly and now it seems like nothing is happening as much. What is your opinion, Craig? Thank you for always updating and explaining everything. Hi Jennifer, the latest news that I have heard is that Turkey is sending an enormous military convoy into Idlib. I hope that that cures your boredom.